Jeep Certified, GREAT MILES 57,375! FUEL EFFICIENT 28 MPG Hwy/21 MPG City! Latitude trim. Heated Seats, UCONNECT VOICE COMMAND W/BLUETOOTH, Alloy Wheels, RADIO: UCONNECT 430 CD/DVD/MP3/HDD, SECURITY AND CARGO CONVENIENCE GROUP READ MORE! Heated Driver Seat, Heated Seats Rear Spoiler, Privacy Glass, Keyless Entry, Steering Wheel Controls, Child Safety Locks. RADIO: UCONNECT 430 CD/DVD/MP3/HDD 6.5" Touchscreen Display, 40GB Hard Drive w/28GB Available, SECURITY AND CARGO CONVENIENCE GROUP Soft Tonneau Cover, Universal Garage Door Opener, Vehicle Information Center, Rear View Auto Dim Mirror, Security Alarm, Tire Pressure Monitoring Display, UCONNECT VOICE COMMAND W/BLUETOOTH Rear View Auto Dim Mirror w/Microphone, Remote USB Port, ENGINE: 2.4L I4 DOHC 16V DUAL VVT Wheels: 17" x 6.5" Aluminum, Tires: P215/60R17 BSW AS Touring, TRANSMISSION: 6-SPEED AUTOMATIC Remote Start System (STD). 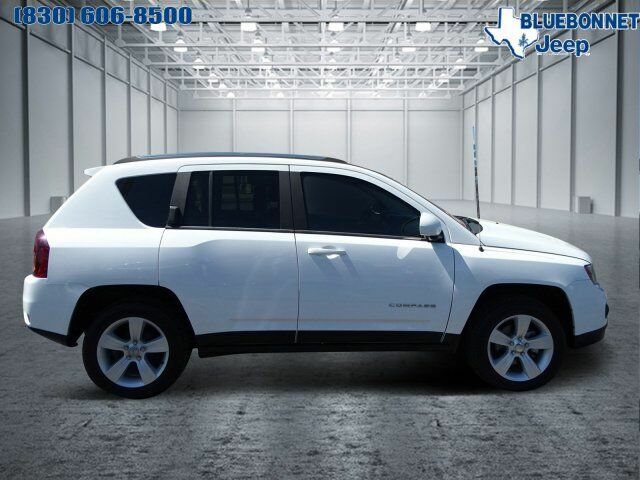 KBB.com's review says "The interior of the 2014 Jeep Compass includes soft-touch materials on the door trim, a comfortable center armrest and a steering wheel that provides decent feel and grip.". Great Gas Mileage: 28 MPG Hwy.